Company: Other peaceful community fish, larger less aggressive African Cichlids. Aquarium Setup: Moderately planted with real or fake plants. Hiding spots such as caves or driftwood for Synodontis Nigriventris to seek refuge from the light in. Feeding: Will readily accept most foods. Breeding: Breeding of Synodontis Nigriventris is not common in the home aquarium, and usually occurs by accident. Eggs are reported to have been laid inside PVC pipe, in flower pots, and in depressions made in the gravel. 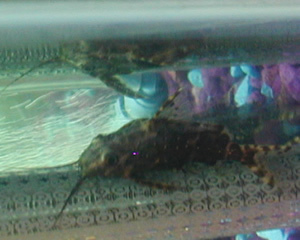 Picture of Upside-down catfish - Synodontis Nigriventris.